SEATTLE — The National Basketball Association (NBA) encourages players, teams, coaches and executives to get involved with charities and participate in community development. The NBA also has structures in place that give anyone within the company an easy path to helping people. Much of the charitable and aid work done by and through the NBA is domestic. This allows players and coaches to touch the lives of fans who regard them as heroes. Programs led by the NBA have contributed over 4 million hours of hands-on service which has produced more than 1,115 places for kids, families and communities to play and learn. The NBA has systems in place that allow for charitable contribution around the world. NBA Cares, the charitable wing of the association, debuted on the international stage in 2001 with a camp for children from countries that made up the former Yugoslavia. The second camp was the following year and brought together Greek and Turkish youth for a three-day camp of on-court skill and leadership development. These camps are today famous by the name Basketball Without Borders (BWB) and have since been hosted around the world. While the camps still serve the purpose of unification and community building, player and skill development is also a top priority. It is very important for young players from impoverished countries or regions to reach their potential on the court and to develop useful skills that can help them off the court. These camps are the primary outlet for the NBA’s aid to developing nations. More importantly, they serve as temporary epicenters for all kinds of outreach, education and development, and they serve as a host for other organizations that also utilize basketball’s popularity as means of interacting with and helping impoverished communities. While many of the Basketball Without Borders’ partners run vital programs at the camps, some of the most substantial work is completed away from it. Organization Habitat for Humanity was included at the camps since 2007, producing valuable infrastructure for community development. Typically, an afternoon is reserved for construction that is undertaken by NBA players, coaches, executives and camp participants. At a 2018 camp in South Africa, 10 homes were built for low-income families as well as for education and recreation purposes. In total, 47 homes have been built in South Africa to the benefit of low-income families and communities. In these camps, life-changing interventions often occur. While many young talented players are attracted to the camps for the chance to learn from NBA players and coaches, they also learn lessons on leadership, responsibility, health and other topics that can help them not only in potential professional career but in life in general. One organization that insists on teaching these valuable lessons is Hoops 4 Hope (H4H), an organization that uses sport to instill change in individuals and communities. H4H started in 1995 in Senegal with just a few dozen basketballs and pairs of shoes. Today, it reaches over 10,000 students every year in 70 schools across Africa. The organization tasks itself with giving children and young adults the tools needed to face the many challenges of growing up in disadvantaged communities. Partnering with NBA Cares and Basketball Without Borders has given this organization tremendous access to at-risk young people and communities. Its partnership with NBA Cares began in 2004 by coaches helping the organization with fundraising. It grew in 2006 with Hoops 4 Hope conducting its Skills 4 Life curriculum for BWB campers which has continued at every camp in African since. Skills 4 Life lessons are tailor-made for each community H4H comes across and often focus HIV/AIDS awareness, substance abuse, gender, risk, conflict resolution, leadership and the “7 tools of a Champion.” The Skills 4 Life curriculum utilizes basketball activities, songs, role-playing games and circle discussions to emphasize the importance of a healthy lifestyle, critical thinking, community and life planning. While Hoops 4 Hope teaches its Skills 4 Life curriculum year round out of its headquarters in Zimbabwe, Basketball Without Borders’ camps provides this organization with an opportunity to teach young people from all over Africa in conjunction with NBA players, legends and coaches. 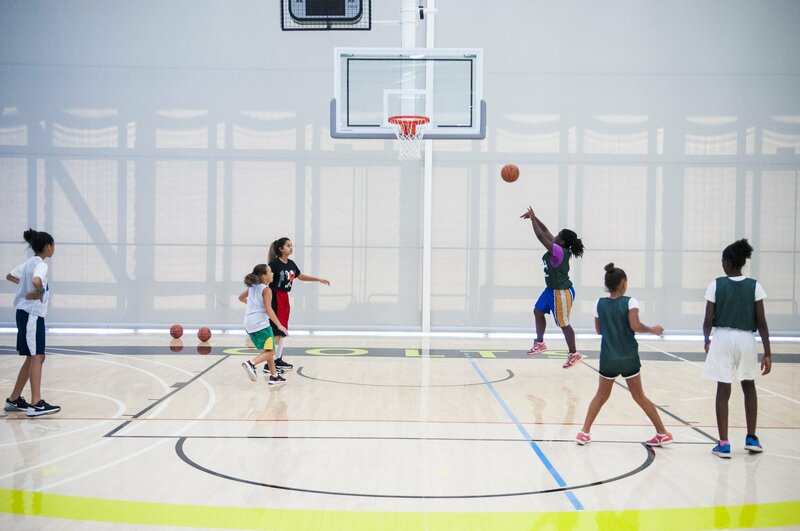 While campers get to meet and learn from some of the world’s most talented players, they also bear witness to their heroes promoting healthy living and community engagement. Basketball is being played all over the world, and the NBA is growing more popular each year. The Basketball Without Borders and its camps are already a success for the NBA and campers, with many participants ending up playing in pro leagues around the world and 46 former campers being drafted into the NBA. But the goal is not to just develop talent and cultivate new markets of basketball fans. It is also providing aid to developing nations where basketball can be used to pull people and communities out of poverty.